It takes a grand total of two seconds to situate exactly where “Primetime,’’ the second album by the Boston-based the Lights Out, stands — or rather, roars — on the musical spectrum: those vast and fabled rock and roll coliseums of the mind, where sweat, butane, hairspray, and pyro-ignited dreams collide. As if the tell-tale time slot of the disc’s title wasn’t a giveaway, the first sound you hear — a pick scrape loudly skidding across a guitar fret board — supplies an instantaneous memory of good old days and nights gone by. Flicked lighters and Foreigner. Diamond Dave and Def Leppard. Whitesnake videos and, for geezers old enough to remember, Frampton glory. In this micro-genre universe, however, the Lights Out’s brand of buffed, big-hook rock (replete with bona fide guitar solos and gang vocals, even!) may actually sound, to some, like a stranger anomaly than the named gangs of deer, grizzlies, and other assorted game that make up much of the indie-rock landscape these days. In a world of stovepipe jeans and splintered story lines, the Lights Out make broad-shouldered, FM radio-ready rock music (remember radio?) whose latest disc has a time-honored tale to tell: going on the road with dreams of “making it’’ as a band. The group gleaned the disc’s title, literally, from the original branded name of its 10-year-old Dodge touring van, a reliable roadhog they affectionately dubbed “Tim’’ after scraping off the remaining “Primetime’’ letters emblazoned on the back. 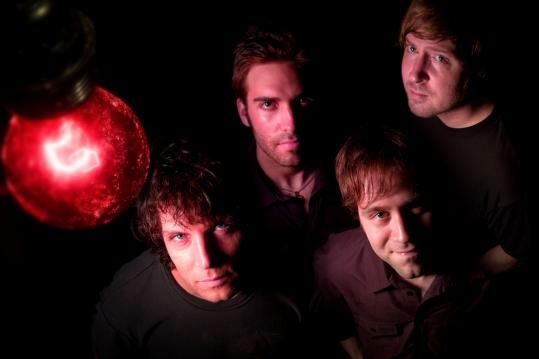 Each apparently liked what the others heard, because with drummer Jesse James (yes, that’s his name) aboard, the Lights Out quickly got to work, playing out as much as possible and recording three EP’s — material that provided grist for last year’s bracing full-length debut, “Color Machine.’’ Although Green and Ritchie say the characters depicted on the new album are fictional composites and not meant to be autobiographical — especially that dude who wrecks his relationships in pursuit of rock stardom — the new songs do hit especially close to home. Jonathan Perry can be reached at roughgems@aol.com.